We took Conor and 5 of his friends to The Web for his birthday. The plan was for us to go there as soon as it opened (11am) and then come home for pizza, cake, and ice cream. For the most part, the plan worked out. The Web has arcade games, bowling, golf, race cars, and of course laser tag. We did not have any clue what to expect, really. When we got there, we had to sign up for a time for the laser tag. Up to 40 people could go at once, so they would be in there with other groups. They have credit card like cards for the arcade part - charge it up and slide it through a reader on the game you want to play. There wasn't a lot of time before the laser tag appointment - so the boys just ran around looking at all the things to do. Then it was time for laser tag - I was the only one who didn't go, I wanted to try to take pictures but the viewing window is so dark that you can not. Jeff, Ceara, Conor, Mason, Gage, Grant, Trey, and Shane all went into an instructional room to learn how to play it. They were all given vests and guns. There were two teams - Red and Blue and our group was all on the same team. There are obstacles in the room, and it's dark, and they have glow in the dark stuff. They say don't run, but I did see a few people running. The teams are released from different doors and you go around looking for them to shoot. There is a sheet at the end that has your tag name (everyone is assigned a name based on what vest/gun they got) and it has all the stats. How many people you shot, how many times you were shot...etc. Our team won over all. 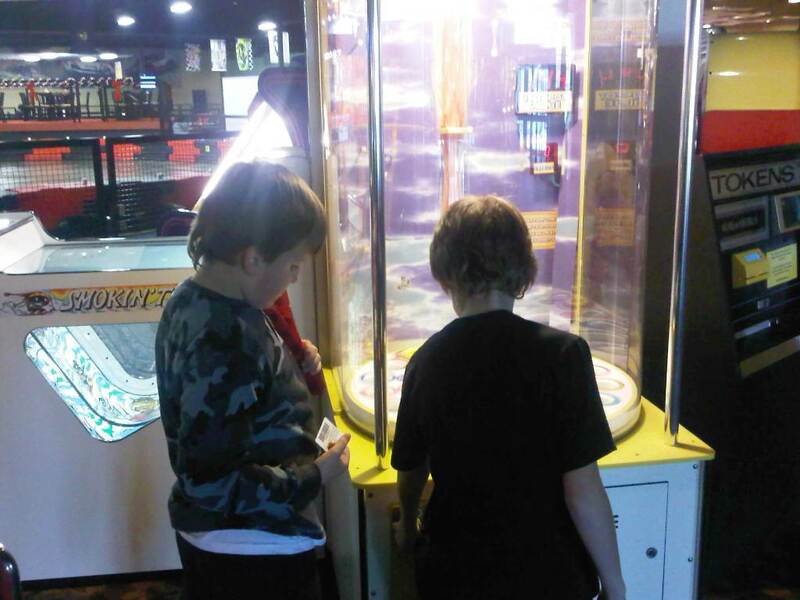 After the laser tag, we went to play miniature golf - it was that or bowling and the boys all chose golf. The theme was Jurassic Park and it was dark with glow in the dark painted / carpeted golf things (yeah, I don't know what they are called). That part of the day was a little hectic and I wish they would have chosen bowling. They did not take turns, they ran around the room hitting the balls as hard as they could and no scores were kept. It was a good thing no one else was there at the same time! 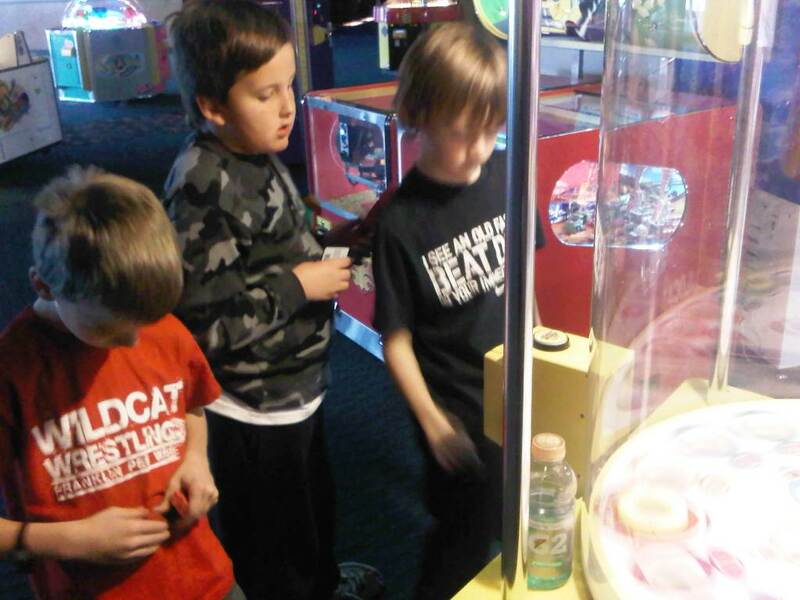 They finished quickly and moved onto the arcade games. Mason got lucky right off the bat and hit a wheel of fortune game for a lot of tickets. 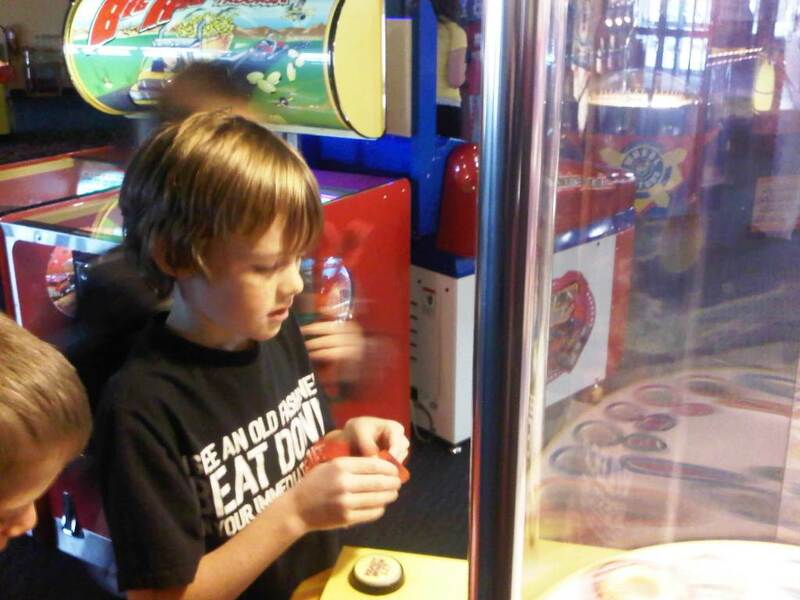 All the other kids were jealous and tried to play the same game to get as many as he did. They easily went through their arcade credits, and we even bought extra so they could continue the fun for a little bit. Then it was time to cash in. I have a lot of respect for the patience of the employees who work in this area - they changed their minds so many times, wanting to see this or that, then wanting something else. It got so bad that Grant had to be handcuffed and almost hauled away! That poor little girl in the picture had to wait her turn behind 6 boys who weren't about to give up their turn in line for a girl! Nothing stands between boys and their toys at that age. We came back to our house, stopping to get pizza on the way. The boys ate pizza while we frantically searched for candles. I knew I had them, just not where they were... I eventually sent Alli to get some at the store. Conor blew out his candles, with Gage standing by ready if he needed assistance! He opened his gifts from the kids while we all had cake and ice cream. He got a remote control car. And the ever favorite money! As well as a robe that he had been begging for since he saw it. After we managed to get rid of all of the kids (it was harder than you might think! ), we took Conor to his restaurant of choice (Golden Corral - yes, it is his favorite) and had his grand parents go there with us to celebrate his birthday. He had a few more gifts to open there. Barb made him a cute little box with a cutout of him in his Nutcracker uniform. One of his favorite gifts inside - money! And a bunch of little games that he was so interested in we had to remind him he had other gifts. He got an electric snap kit so that he can learn how to make different things - sirens, radios, etc. He was very interested in seeing all the things he could do. There are a lot of projects in that book - different levels of difficulty. And then he got what he has wanted for a very long time. See his face? He was so surprised. Yes, we got him a cell phone. This looks like a great party! Kids love video games, but golf is a new for me. I am planning my son’s birthday party in one of the Seattle venues and I was just looking at some birthday experiences. This is my first time planning anything and I just want it to be perfect. How do things get in my head?